Cars are becoming wearable devices. Smartphones are pretty much annealed into car consoles at this point, and automakers are figuring out how much more functionality they can add before the display looks like the control panel of the Millennium Falcon. Maybe what is missing is the need-to-know: which devices and apps are car drivers actually using? Not a lot of them, if J.D. Power's new 2015 Driver Interactive Vehicle Experience is correct. 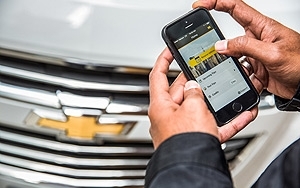 And the not-great news for automakers like GM, which invested a lot in its 4G LTE WiFi deal with ATT, is that so far, in-car routers and concierge services aren't on that must-have list. The report, which looks through a 90-day ownership window to gauge who is using what, found that 20% of new-vehicle owners have never used 16 of the 33 technology features that the firm measured. The five features owners most commonly report that they "never use" are in-vehicle concierge (43%); mobile routers (38%); automatic parking systems (35%); head-up display (33%); and built-in apps (32%). The study also found that there are 14 technology features that 20% or more of owners do not want in their next vehicle. Among them are Apple CarPlay and Google Android Auto, in-vehicle concierge services and in-vehicle voice texting. Among Gen Y, the number of features unwanted by at least 20% of owners increases to 23, specifically technologies related to entertainment and connectivity systems. "In many cases, owners simply prefer to use their smartphone or tablet because it meets their needs; they're familiar with the device and it's accurate," said Kristin Kolodge, executive director of driver interaction & HMI research at J.D. Power, in a statement. "In-vehicle connectivity technology that's not used results in millions of dollars of lost value for both consumers and the manufacturers." When owners said they didn't want a feature, it was mostly the simple fact that they didn't find it useful in their current vehicle. And they hadn't chosen it in the first place, since they averred that "it came as part of a package on my current vehicle and I did not want it." The study also suggests that if dealers knew more about the technology themselves and were adept at explaining it there would be a higher likelihood there might be a higher chance that customers would use it. And if the features aren't activated when the customer drives off the lot, they may not know they even have it. But, said Kolodge, "while dealers are expected to play a key role in explaining the technology to consumers, the onus should be on automakers to design the technology to be intuitive for consumers." She said automakers should do more to explain the technology to dealership staff and train them on how to demonstrate it to owners. On the other hand, the study found that the technologies owners most often want are those that enhance the driving experience and safety, available as a built-in feature. What they said they are most interested in are vehicle health diagnostics, blind-spot warning and detection, and adaptive cruise control. "The first 30 days are critical. That first-time experience with the technology is the make-it-or-break-it stage," said Kolodge. "Automakers need to get it right the first time, or owners will simply use their own mobile device instead of the in-vehicle technology."